How to Use THIEVES WIPES 30 CT: Ideal for use on door handles, toilet seats and anywhere undesirable bacteria may be present. Caution: Not for use on infants or on sensitive areas of the body. Please note: The "Add to Cart" button is only for retail purchases. 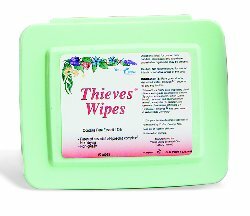 If you want to sign up as a preferred customer (autoship program) or as a distributor, you will need to enroll first and then add THIEVES WIPES 30 CT to your cart. Please see the How to Order page for more details.